In today’s world of likes, swipes, snaps and stories, it’s easy to feel lost in the shuffle of human emotions. What we have to be mindful of is maintaining real human connections with family, friends, and those we work or do business with. What better way to keep those connections strong this season than with a personalized holiday card! Remember the days of snail mail? Before blue texts and sliding into DM’s. When people would actually handwrite letters to each other to express love, joy, sympathy, humor, and a myriad of other human emotions. Greeting cards allow us to capture that moment and feeling again. They show the recipient that you were thinking of them, that they’re important to you, and that you wish them all of the happiness that the holiday season brings. Think of the smile that comes to your face when you receive one of those cards. Don’t you want to spread that smile to others? And don’t think that personalized cards are only meant for close friends and family. Sending cards to clients and people you do business with is a fantastic way to show them that you value their business, and remind them of why they do business with you. Because you care. In case you needed more convincing, here’s a list from Corcoran Printing highlighting eight great reasons to print a corporate holiday card. POP THE PIXEL can help you design the perfect greeting card tailored to your specific needs. Whether you prefer sticking to tradition by utilizing the folded card, or bucking the basics for something a little different, like the double-sided post card, we will custom-design the perfect card that best represents you. Our work doesn’t stop in the design department, either. We’ll take the reins from start to finish by working with a printer in designing and producing your card, and finishing it off by having your cards sent directly from the distribution center to their destination addresses. Just remember, the creative process takes about one month, from start to mailing, to complete. So plan ahead, and get started now. Don’t wait too long and get left out in the cold. This is one naughty list you don’t want to be on. Call or email us today for a consultation, and let’s get started on your custom greeting cards. Show those who matter the most that you appreciate them all year round. 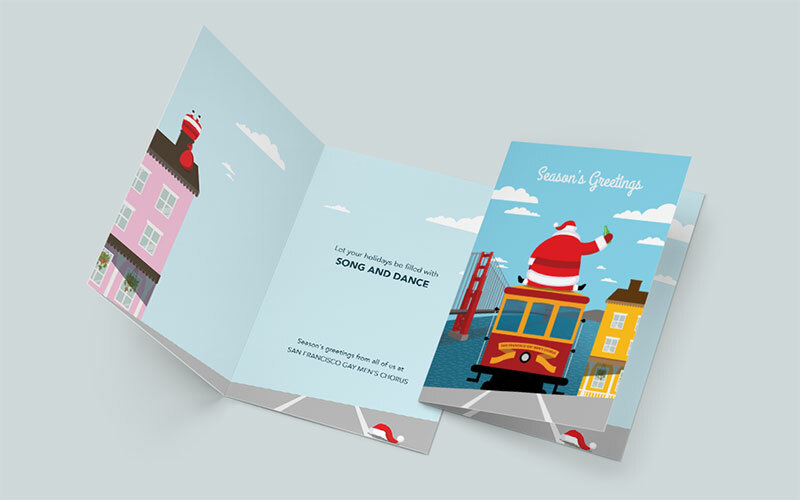 POP THE PIXEL loves creating festive greeting cards for any occasion, and we’ve certainly made plenty. Just stalk our Instagram and you’re sure to find some sprinkled in there. Then, call 323-848-4465 or email us, and let us help make your holiday experience merry and bright!